These easy Peach, Cheddar and Honey Quesadillas are a simple savory-sweet snack that's perfect for when you're craving a little something to enjoy while watching TV, or after a long night out. The combination of sweet, ripe peaches, sharp cheddar, salted butter, and honey satisfies so many different flavor cravings. They only take a few minutes to make, and you can personalize them by swapping in your favorite seasonal fruit and cheeses. Slice peaches into 1/2” thick slices. Heat the butter in a skillet over medium-high heat until melted. Swirl the pan around to coat evenly. Spread out the tortillas in the pan and let them crisp for a few seconds. Flip each one, then add a generous handful of cheese and a few slices of peaches. Top the peaches with a bit more shredded cheese. Cover with another tortilla and press down slightly with the back of a spatula. Let cook about 2-3 minutes, then flip and continue to cook until other side is crisp, cheese is melted, and peaches are heated through. 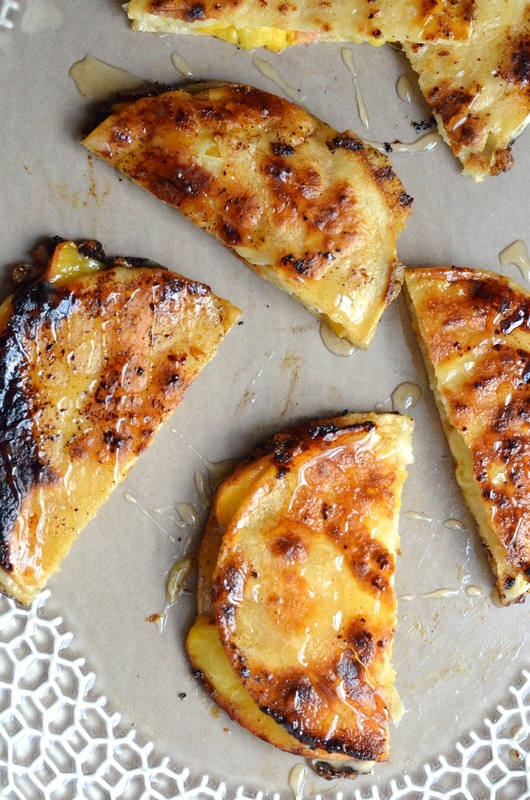 Remove from pan, cut each quesadilla in half, and drizzle with honey. Serve immediately.